After months of softening, home prices began to rise in February. That trend continued in March. While prices in most areas were down from the same time last year, they increased over the prior month. New listings rose as well, offering buyers more options and more time to make the right choice. 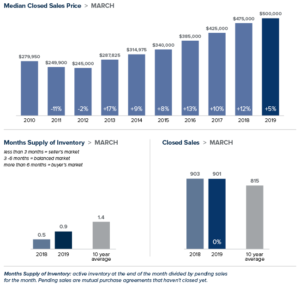 Despite the uptick in listings, inventory is still under two months of supply, far short of the three to six months that is considered balanced. >>>Click image to view full report. The median price of a single-family home in Seattle hit $752,500 in March, down 8% from a year ago, but up $22,500 from February. Inventory rose 136% over last year. Despite the increase, new listings that were competitively priced saw many multiple and contingency-stripped offers. Unlike most of King County, home prices on the Eastside grew over the prior year. The median price of a single-family home on the Eastside rose 3% to $950,000. That represents an increase of $50,000 over February. Amazon’s plans to relocate its worldwide operations team to Bellevue is expected to add thousands of employees to their Eastside campus and put even more demand on what is already tight inventory. The median price of single-family home in King County in March was $667,725. That figure was down 3% from the same time last year, but up from the $655,000 median price in February. The two areas that showed price increases year-over-year were the most expensive area in the county – the Eastside – and the least expensive – Southeast King County. The number of homes for sale was more than double that of a year ago, but still far short of enough to meet demand. In Snohomish County, the median price of a single-family home grew 5.3% over last year to $500,000. That was an increase of $25,000 over February. A new passenger terminal at Paine Field is expected to provide a boost to the local economy and also lift demand for housing. This post originally appeared on GetTheWReport.com. 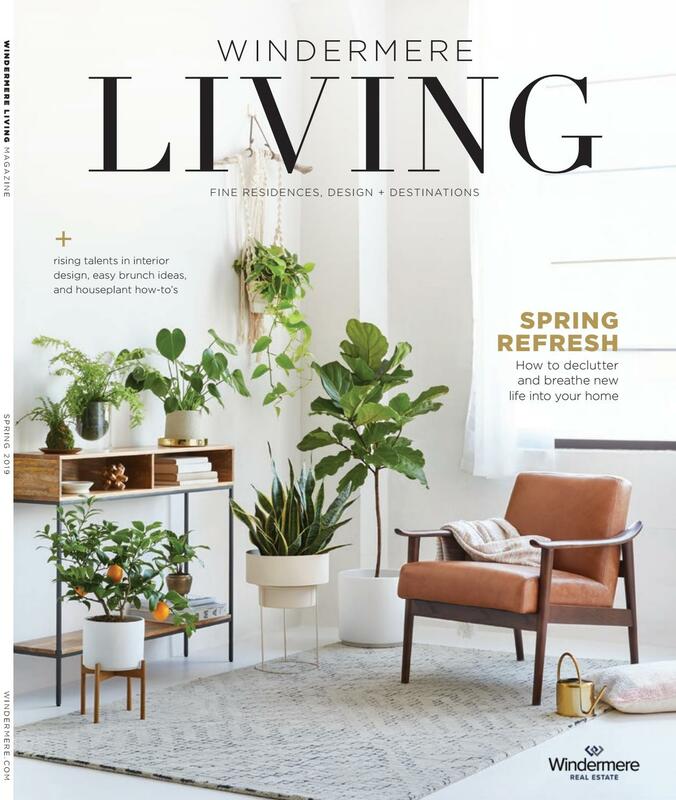 The Spring 2019 issue of Windermere Living showcases rising talents in interior design, spring refresh strategies, easy brunch ideas for your next get together and a helpful houseplant guide. Windermere Living is an exclusive listings magazine published by Windermere Real Estate. Read the online version by clicking on the image below. This post originally appeared on the Windermere Eastside blog. The spring home buying season started early this year. Open houses had increased attendance and bidding wars returned. After months of softening, home prices in most of the region jumped significantly from the prior month. With just one month of data, we’ll have to wait and see if this is the start of a longer upward trend. More inventory and low interest rates helped bring buyers back into the market. The median price of a single-family home in Seattle hit $730,000 in February, down 6 percent from a year ago, but up $18,500 from January. With just six weeks of available supply, Seattle continues to have the tightest inventory in the county. Seattle’s record development boom shows little signs of easing, so we can expect strong demand to continue. The Eastside was one area of King County that continued to see prices moderate. The median price of a single-family home on the Eastside was $900,000 in February, a drop of 5 percent from a year ago and down slightly from last month. However, supply here isn’t nearly enough to meet demand, a fact that most likely won’t change any time soon. Amazon’s latest expansion in Bellevue is expected to bring a significant wave of new employees to the city. The median single-family home in King County sold for $655,000 in February. While up slightly less than 1 percent year-over-year, it was an increase of $45,000 over January. Southeast King County, which includes Kent, Renton and Auburn, saw the greatest gains with prices rising 4.5 percent over the previous year. 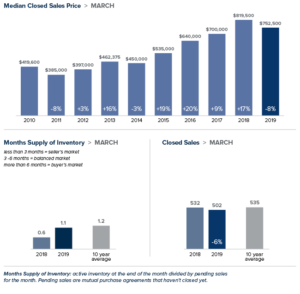 While inventory has grown, it is less than half of the four to six months that is considered balanced. The median price of a single-family home in Snohomish County reached $474,947 in February. Although that is a 2 percent decrease from last year, it is $5,000 more than January. As buyers push outside of King County to search for more reasonably priced homes, Snohomish County continues to struggle to find enough inventory to meet growing demand. This post originally appeared on the WindermereEastside.com Blog. January brought more good news for homebuyers. Prices were down, inventory was up and interest rates hovered near a nine-month low. Those factors drove more buyers into the market and resulted in an uptick in sales for the month. We’ll see how this transitioning market evolves as we head into the prime Spring home buying season. January marked the first time home prices in King County decreased year-over-year in seven years. The median price of a single-family home was $610,0000, a drop of 3 percent over the prior year. Inventory more than doubled. Unlike recent months, this was due primarily to more people putting their homes on the market, as opposed to homes taking longer to sell. Despite the surge in listings there is just two months of available inventory, far short of what is needed to meet demand. The most expensive region in King County saw prices soften in January. The median price of a single-family home on the Eastside dropped 3 percent over last January to $910,000. It’s an excellent time for buyers to leverage the cooling market and negotiate terms that work best for their needs. Last January, 39 percent of the homes in this area sold for over asking price. This January, that figure dropped to 12 percent. With its favorable business climate and high rankings for both economic growth and technology capabilities, demand on the Eastside is projected to remain strong. The median price of a single-family home in the city was $711,500 in January, a decrease of 6 percent year-over-year. Despite a 107 percent increase in homes for sale compared to a year ago, Seattle continues to have the tightest inventory in King County with less than two months of supply. A booming economy that shows no signs of slowing continues to draw more people to the city. The area will have to significantly add more inventory to meet that growing demand. The median price of a single-family home in January inched up 1 percent from last year to $455,000. That price is down from the median of $470,000 recorded in December. Snohomish County also saw a surge in inventory with the number of homes on the market double of what it was last year at this time. A portion of the money raised every year is due in part to our agents who each make a donation to the Windermere Foundation from every commission they earn. Additional donations from Windermere agents, the community, and fundraisers made up 68% of the money collected in 2018. Each Windermere office has their own Foundation funds, which enable them to support local non-profits in their communities. One organization that received Windermere Foundation donations from several Windermere Real Estate offices in the Seattle area is Treehouse. Treehouse’s mission is to give foster kids a childhood and a future. Their goal that they have set to achieve by 2022, is to see youth in foster care graduate from high school at the same rate as their peers across Washington State. And to provide them with support and a plan to launch successfully into adulthood. Donations from the Windermere Foundation have helped Treehouse clients like Ashley, get the support she needed to turn her life around. 2018 also marked the third year of our #tacklehomelessness campaign with the Seattle Seahawks, in which Windermere committed to donating $100 for every Seahawks home game defensive tackle to YouthCare, a non-profit organization that provides critical services to homeless youth. While the Seahawks didn’t make it past the first round of the playoffs, they did help us raise $31,900. When added to previous seasons, the total donation for the past three years is $98,700! We are grateful for the opportunity to provide additional support to homeless youth thanks to the Seahawks, YouthCare, and the #tacklehomelessnesscampaign. Thanks to our agents, offices, and everyone who supports the Windermere Foundation, we have been able to make a difference in the lives of many families in our local communities over the past 30 years. If you’d like to help support programs in your community, please click the Donate button. To learn more about the Windermere Foundation, visit http://www.windermere.com/foundation. This post originally appeared on the Windermere.com blog. A cool-down in prices and a surge in inventory spelled out good news for buyers in December. Median home prices throughout the region continued to moderate. The number of homes for sale more than doubled over a year ago. Condo inventory more than quadrupled. While we’re still far short of the four to six months that are considered a balanced market, December moved us closer in that direction. 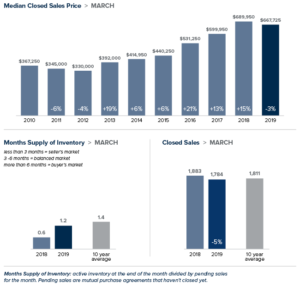 As winter months traditionally bring slower sales and lower prices, we’ll be able to determine a more solid trend when the peak real estate season comes this spring. Last December there were only 299 homes on the market in Seattle. This December there were 1,111. Despite the sharp uptick, Seattle has the tightest inventory in King County with less than two months of supply. Demand is predicted to stay high in 2019. With an abundance of high-paying jobs and not enough people to fill them, Seattle’s population is expected to grow at twice the national rate this year. Prices have continued to moderate from the unsustainable increases of last year. The median price of a single-family home inched up 2 percent from the year prior to $739,000. The number of single-family homes and condos on the market in December tripled as compared to a year ago on the Eastside. With an abundance of choices for buyers, homes here took longer to sell. However, well-priced homes still sold within weeks rather than days, which was the case earlier in the year. As with all of King County, home prices here continued to moderate. The median price of a single-family home was $909,000. That’s down 3 percent from a year ago, but up from November’s median price of $885,000. In December, the median price of a single-family King County home was $639,000. That is 0.6 percent more than the same time last year and a welcome respite from the double-digit increases we saw for much of 2018. Inventory was up as well, soaring 143 percent from a year prior. The trend toward a more balanced market is good news for buyers. Instead of having to make a decision in a matter of hours, buyers now can take the time to consider their options and negotiate a price and terms that work best for them. The median price of a single-family home was up 4 percent from last year to $470,000 in December – the same price the area posted the previous month. Inventory has more than doubled in the past year due to more sellers listing their homes and fewer sales. However, at 2.6 months of supply the area has a long way to go before becoming a balanced market. As we step forward into 2019, eco-friendly “green homes” are more popular than ever. Upgrading your home’s sustainability improves quality of life for those residing in it, but it is also a savvy long-term investment. As green homes become more popular, properties boasting sustainable features have become increasingly desirable targets for homebuyers. Whether designing a new home from scratch or preparing your current home for sale, accentuating a house with environmentally-friendly features can pay big dividends for everyone. While the added value depends on the location of the home, its age, and whether it’s certified or not, three separate studies all found that newly constructed, Energy Star, or LEED-certified homes typically sell for about nine percent more than comparable, non-certified new homes. Plus, one of those studies discovered that existing homes retrofitted with green technologies, and certified as such, can command a whopping 30-percent sales-price boost. Cool roofs keep the houses they’re covering as much as 50 to 60 degrees cooler by reflecting the heat of the sun away from the interior, allowing the occupants to stay cooler and save on air-conditioning costs. The most common form is metal roofing. Other options include roof membranes and reflective asphalt shingles. Fuel cells may soon offer an all-new source of electricity that would allow you to completely disconnect your home from all other sources of electricity. About the size of a dishwasher, a fuel cell connects to your home’s natural gas line and electrochemically converts methane to electricity. One unit would pack more than enough energy to power your whole home. For many years, fuel cells have been far too expensive or unreliable. But as technology has improved, so too has reliability. Companies like Home Power Solutions and Redbox Power Systems have increased the reliability of these fuel sources while reducing their size. Much like we’ve seen computers and cell phones shrink in size while improving reliability and power, fuel cells continue to be refined. A wind turbine (essentially a propeller spinning atop an 80- to 100-foot pole) collects kinetic energy from the wind and converts it to electricity for your home. And according to the Department of Energy, a small version can slash your electrical bill by 50 to 90 percent. But before you get too excited, you need to know that the zoning laws in most urban areas don’t allow wind turbines. They’re too tall. The best prospects for this technology are homes located on at least an acre of land, well outside the city limits. Another way to keep the interior of your house cooler—and save on air-conditioning costs—is to replace your traditional roof with a layer of vegetation (typically hardy groundcovers). This is more expensive than a cool roof and requires regular maintenance, but young, environmentally conscious homeowners are very attracted to the concept. Combining a heat pump with a standard furnace to create what’s known as a “hybrid heating system” can save you somewhere between 15 and 35 percent on your heating and cooling bills. Unlike a gas or oil furnace, a heat pump doesn’t use any fuel. Instead, the coils inside the unit absorb whatever heat exists naturally in the outside air, and distributes it via the same ductwork used by your furnace. When the outside air temperature gets too cold for the heat pump to work, the system switches over to your traditional furnace. Geothermal heating units are like heat pumps, except instead of absorbing heat from the outside air, they absorb the heat in the soil next to your house via coils buried in the ground. The coils can be buried horizontally or, if you don’t have a wide enough yard, they can be buried vertically. While the installation price of a geothermal system can be several times that of a hybrid, air-sourced system, the cost savings on your energy bills can cover the installation costs in five to 10 years. Solar panels capture light energy from the sun and convert it directly into electricity. Similarly to wind turbines, your geographical location may determine the feasibility of these installments. Even on cloudy days, however, solar panels typically produce 10-25% of their maximum energy output. For decades, you may have seen these panels sitting on sunny rooftops all across America. But it’s only recently that this energy-saving option has become truly affordable. In 2010, installing a solar system on a typical mid-sized house would have set the homeowner back $30,000. But as of December 2018, the average cost after tax credits for solar panel installation was just $13,188! Plus, some companies are now offering to rent solar panels to homeowners (the company retains ownership of the panels and sells the homeowner access to the power at roughly 10 to 15 percent less than they would pay their local utility). Rooftop solar panels can also be used to heat your home’s water. The Environmental Protection Agency estimates that the average homeowner who makes this switch should see their water bills shrink by 50 to 80 percent. Many of the innovative solutions summarized above come with big price tags attached. However, federal, state and local rebates/tax credits can often slash those expenses by as much as 50 percent. So before ruling any of these ideas out, take some time to see which incentives you may qualify for at dsireusa.org and the “tax incentives” pages at Energy.Gov. Regardless of which option you choose, these technologies will help to conserve valuable resources and reduce your monthly utility expenses. Just as importantly, they will also add resale value that you can leverage whenever you decide it’s time to sell and move on to a new home. The real estate market continued to improve for buyers in November. Interest rates dropped slightly, price increases slowed and inventory soared. 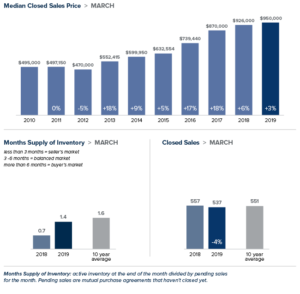 It’s important to note that inventory increases, while significant, are being compared to the record low supply of last year. We’re still far short of the inventory needed for a truly balanced market, however buyers have greater choice and less competition than they’ve had in years. Sellers who price their home according to current market conditions continue to see strong interest. Heading into the holiday season, there’s something for everyone to celebrate. Price increases continued to slow in King County. The median single-family home price was $643,913 in November, an increase of 2 percent over a year ago. South King County, where the most affordable homes in the county are located, saw significantly greater increases compared to a year ago. North King County also posted greater increases than the county overall. Inventory has skyrocketed as the number of homes for sale in King County more than doubled year-over-year. While that’s good news for buyers, there is only 2.1 months of available inventory in the county, slightly down from October and not nearly enough to meet demand. The Eastside economy continues to be very strong. Heavy investment in commercial construction from companies such as Vulcan boost expectations that the area will continue to thrive. The median price of a single-family home in November hit $885,000 on the Eastside. Although an increase of 4 percent from a year ago, home prices have remained steady since this fall. With continued demand and only 2.4 months of inventory, the market has a long way to go to becoming balanced. The median price of a single-family home in Seattle was $760,000 in November. This is up 3 percent from a year ago and slightly up from October. Inventory jumped 177 percent year-over-year however, at just two months of supply, the Seattle area has the tightest inventory in King County. With the city’s strong economy and lifestyle appeal, that’s not expected to change any time soon. Forbes recently named Seattle as the best place for business and careers in the nation. U.S. News & World Report ranked the University of Washington among the top ten universities in the world with Money Magazine rating Seattle the #5 Best Big City to Live In. Inventory in Snohomish County continued to climb, surging 88 percent in November as compared to a year ago. That said, the area has fewer homes for sale than King County with just 1.8 months of inventory. This is still far short of the four to six months of supply that is considered a balanced market. The median price of a single-family home sold in November was up 6 percent from last year to $470,000, virtually unchanged from October. Home price increases in the Puget Sound area have started to moderate. While down from the unsustainable highs of this spring, prices continue to be up compared to a year ago. So, where are home prices headed next? Gardner predicts our local market will fare better than the nation overall. Whether you’re thinking of buying or selling I can provide you with market data that will help you make the best decision for your circumstances. Increased inventory, slower sales and more price reductions all point to a balancing market—welcome news for price-shocked buyers. Sales prices are up from last October and down from the all-time high reached this spring. Despite the slowdown, it’s important to point out that we’re only moving back toward what a normal market looks like. King and Snohomish counties each have over two months of available inventory. While that is double the inventory of a year ago, it’s far short of the four to six months supply that is considered a balanced market. Sellers looking to list their home now can be sure there remains plenty of interest among home buyers. In October, the median price of a single-family home in Seattle was $750,000, up 2 percent from last October and down slightly from last month. While inventory doubled over a year ago, Seattle falls behind most areas of King County in supply with just under two months of inventory available. Demand is predicted to stay high, with Seattle’s population projected to grow at twice the national rate next year. That said, buyers are in the position to be able to negotiate. A recent analysis named Seattle as one of the top markets in the country where it makes the most sense to buy this winter. The median home on the Eastside sold for $890,000 in October, up 5 percent from a year ago and unchanged from the previous month. While year-over-year price increases were in the single digits for the Eastside overall, several areas, including Kirkland, Woodinville and Mercer Island, experienced double-digit price gains. Buyers are still having to pay a premium for desirable Eastside properties. However, with more choices and less buyer urgency, sellers need to price their home correctly to maximize their chances of getting the best possible return. Inventory in King County for all homes, both single-family and condominium, soared 102 percent over last October. The increase was due to an influx of new listings and the fact that homes are now taking longer to sell than at the peak of the market this spring. While buyers now have more breathing room to make their decisions, the 2.4 months of inventory in King County is still far from a balanced market. The median price of a single-family home in October was $670,999, an increase of 7 percent from the same time last year, and virtually unchanged from August and September. South King County showed larger increases, with prices rising more than 10 percent from a year ago in Auburn, Kent and Renton. Inventory in Snohomish County soared 65 percent in October as compared to a year ago. The area now has 2.4 months of inventory, about the same relative supply as King County. As with most of the Puget Sound area, the increase in inventory was due to a higher number of sellers listing their homes and fewer sales. Year-over-year, the median price of a single-family home sold in October in Snohomish County grew 8 percent to $473,000. The median price in September was $485,000.